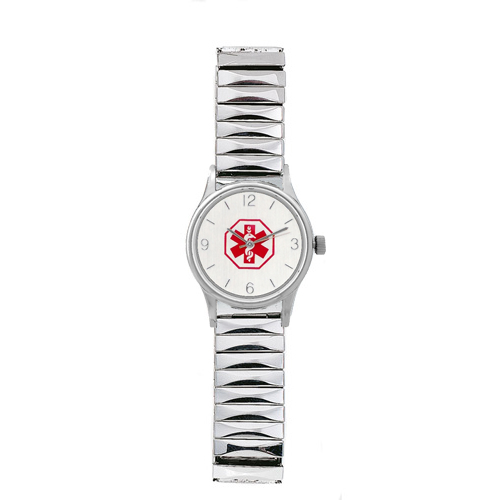 Stylish stainless steel women's medical ID watch with expandable band. Band has no clasp and easily stretches over your wrist. 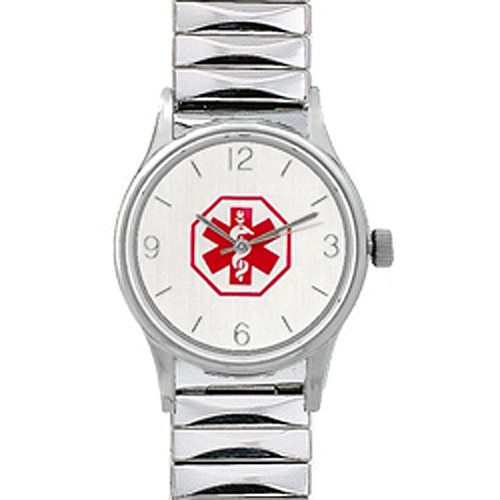 Watch is approximately 7 inches in length and expands to 9 inches. Links may be removed at any local jewelry store if a smaller fit is needed. 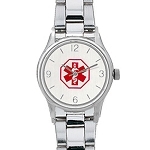 My mom doesn't wear bracelets so when I needed to get her a medical alert item i started searching for a watch. 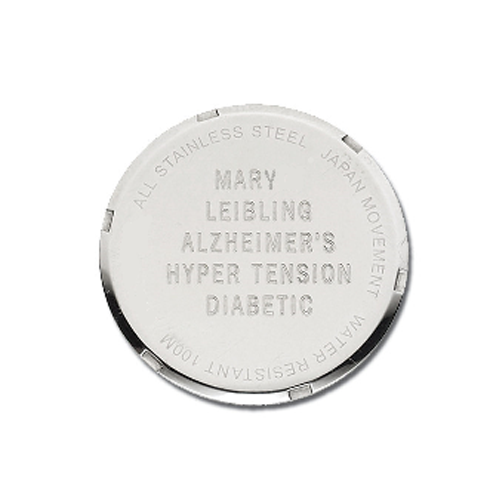 I found this one so I ordered it for her 85 birthday. What a great watch!! It was exactly what I was looking for. It even came with an extra battery. The thing we had to do was get the band adjusted since my moms wrists are small. An emergency required a medical alert "device". I placed the order with Elegant and followed up with a phone call asking if they could rush. They were courteous and professional and expedited the order. The engraving on the back of the watch was precise. I am pleased with the product and company. I love this watch. It's classy and I've already received compliments! The engraving is well done and the watch keeps excellent time. However, the size needs to be scaled down for a woman. It looks much too large on my wrist. I really like my watch but I would have liked it to be a little bit smaller, especially the strap.It looks too big on my wrist. 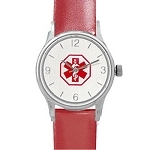 Not only does the watch keep accurate time it is also practical and attractive. Even my Dr. noticed it and was impressed. Love it ! 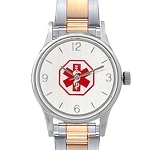 Pretty watch with nice engraving. Thank you.